this is a new topic area providing details on CRUZ SportCruiser/PS-28/PiperSport Aircraft Letters of Authorization (LOA) for Improvements authorized from Czech Sport Aircraft (CSA). 1) If you have received a Letter of Authorization (LOA) from Czech Sport Aircraft for a modification to your CRUZ aircraft, please post a summary here. 2) If you are WAITING for a Letter of Authorization (LOA) from Czech Sport Aircraft for a modification that you have documented and requested via US Sport Aircraft to CSA, please post a summary here. Include your current "WAIT TIME" from the date that you requested the LOA to the date of your posting. 3) If you have any SUGGESTIONS on ways to improve the speed of Letter of Authorization (LOA) Processing by CSA, please post ideas here. 4) If you have received Formal Authorization for ROTAX 912 ULS Engine changes, please post details here. 5) For reference, members of the SCFLIER FORUM documented their Ranked List of requests for CRUZ Aircraft Improvements in July of 2016. As far as I know, in the last 3 months, there has been no measurable progress in addressing these requests for Improvements on the Top 5 Items on the list. The picture attached summarizes our "desired CRUZ improvement" 7-18-2016 ranked list. "2nd place -what exactly are you expecting for a LOA to "improve cruise and climb performance"? You could change the fixed pitch of the prop but that will improve either cruise OR climb performance, not both. That list is for general "improvements" to the overall aircraft. Access to "timely" LOA for Dynon AOA install is top on the list. The LOA has nothing to do with performance. The rest are suggestions for other improvements. Number 2 ??? Frankly, I dont understand why someone would knowingly buy a LSA with a 100HP motor and then complain about it's performance. I love my plane! And plangley is right, you can't have your cake and eat it too. Agree with the above comments on Climb vs Cruise performance and LSA limitations with the 100 Hp 912 ULS Rotax. Adjusting fixed pitch propeller is a basic tradeoff between climb and cruise. 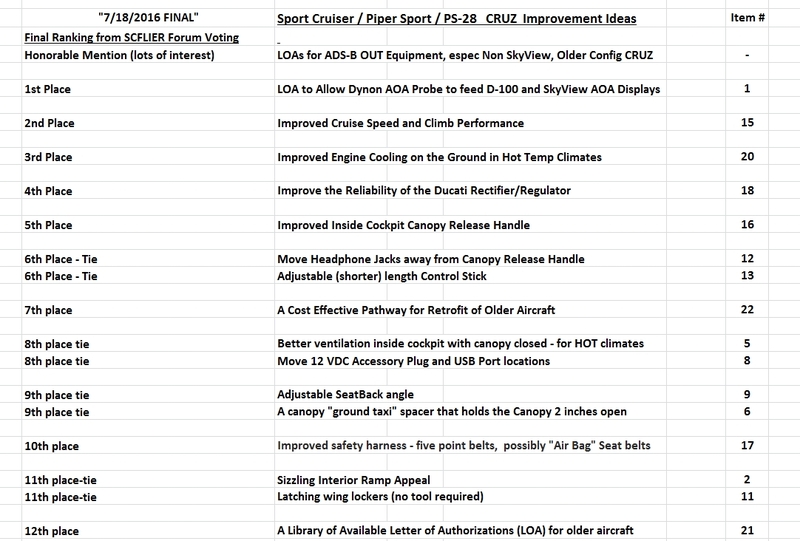 Also, the "Improvement List" really is under the heading of "what do CRUZ Owners Want", and some of these may be beyond LOAs - they might be entirely new changes, that MIGHT be retrofittable to older CRUZ aircraft. The "improved canopy release handle" might be a retrofit option, if CSA could come up with a "better design". Under the heading of Improved Climb and Cruise Speed performance, agree with Shawn's comments above, but the votes indicated that several folks had that "Improvement Item" on the top of their wish list. and, under the heading of "what if"..... related to cruise speed and climb performance improvements, there are LSAs that are faster and climb better than some of our CRUZ models. perhaps ? installing the Rotax 914 turbocharged engine to get some more climb performance especially at higher altitudes. Back to the question at the top of the post. thanks for providing any other LOAs that you may have used or heard implemented on the CRUZ aircraft, and for those that you may have requested through US SPORT AIRCRAFT to Czech Sport Aircraft for review and approval. I have a LOA request in for the installation of the Garmin Aera 660 gps to replace the now discontinued Garmin GPSMAP 396 that came in the early aircraft. This is a direct swap with no physical modification to the aircraft or any additional equipment at all. I submitted all requested documentation and then some to US Sport on August 15th, 2016 and Patrick forwarded it to CSA according to his email to me on the 17th. I do not know the exact day Patrick submitted it to CSA. I followed up just over a month later and Patrick's response was "still no word from the factory. I have sent several emails back and forth. I have also forwarded your comments. I hope to have a resolution shortly." Tomorrow is my second scheduled follow up with Patrick. I have a reminder on my calendar to contact Patrick monthly for any updates or if CSA is requiring any more data or information. I'll report back here as to what I learn each follow up. It is my understanding that there is also a request in from US Sport for the Garmin GTX-345 all in one transponder/ADS-B unit. This is to help the older fleet comply with the 2020 mandate for ADS-B out. My Aera 660 request goes hand in hand with the GTX-345 request as the older Garmin GPSMAP's 396/496/696 will not display ADS-B info from the newer Garmin ADS-B equipment. The technology for the older GPSMAP's is just that, old and outdated. Maybe Patrick can update the group on this request. Just out of curiosity, why did you choose the Aera 660? I am also equipped with the Garmin 396. Nice little unit as a backup, but I am interested in your reasons for the 660. When I do the ADS-B upgrade, I plan on adding a few other things and the Aera 660 may be one of them. Mainly it's the easiest way to upgrade, it's a direct swap, bolt for bolt, for the 396/496 unit. No modifications are needed to mount it in the instrument panel. The Airgizmos are the exact same size when mounting them in the panel. My instrument panels are shorter than the newer 2010 and up planes. Our panel real estate is limited and we cannot install the 796 as it's too big. (unless you want to spend tens of thousands of dollars and upgrade your instrument panel to the current panel size). It's designed to go hand in hand with the new GTX-345 all in one transponder/ADS-B unit, the manual has a section on wiring the two units together. The 660 is a 796 in a smaller footprint and has some newer features. I could go on and on about the 660 but to sum it up the main reason is because there is no physical modification needed to the aircraft. This is probably the easiest LOA that CSA will have to approve. There's nothing else to mount, no cutting or drilling required and the wiring is wire for wire with the addition of 1 serial I/O line on the new 660. It has 2 serial I/O lines whereas the 396/496 only has one. And it's wireless to stream data to other Garmin products, like the GTX-345, and your ipad or tablet of choice. Hope this helps, if you need more specific info please let me know. I have a ton of data I gathered for this LOA request. I know many people fly with a tablet these days with Foreflight or Garmin Pilot, I do have an iPad mini with foreflight. With the 660 and an ADS-B receiver or ADS-B in/out you won't need a tablet unless you just want a larger screen. I like a sterile cockpit and the fewer the gadgets for distraction the better. I do always have my iPhone and iPad in the plane as backup but they are stowed away as a "backup" only. Mainly it's the easiest way to upgrade, it's a direct swap bolt for bolt for the 396/496 unit. No modifications are needed to mount it in the instrument panel. The Airgizmos are the exact same size when mounting them in the panel. Our instrument panels are shorter than the newer 2010 and up planes. Our panel real estate is limited and we cannot install the 796 as it's too big. (unless you want to spend tens of thousands of dollars and upgrade your instrument panel to the current panel size). Thank you Shawn, that's just what I was looking for. All good points. You're very welcome and glad to help. The 660 is awesome. Again, welcome to the forum. There is a lot of valuable info here that you won't find anywhere else on our planes. If you ever have a question it can be answered here in this forum. What year is your SportCruiser? Hours? Mine is a 2007 with just over 800 hours. That being said, does anyone even know how many LOA's have been issued by CSA or CAW (the previous company name)??? My bet is I can count them one one hand. Sure would be great if CSA would dedicate a webpage under the section "technical publications" on their website that listed all LOA's issued and those in progress with dates and aircraft. I know, wishful thinking. I have read about many SLSA to ESLA conversions or re-registrations. It's a rather simple process with of course a lot of paperwork and can be completed at your local FSDO. 2020 mandate on the horizon make me think what are owners going to do. Yes Ronin5573 and keep in mind you dont need an LOA if the new part you want to install is already in newer planes and included in the IPC and maintenance manual. This means these new parts have already been approved by the manufacturer, no LOA needed. Just simply follow the maintenance procedures to remove and replace and be sure it's done by the proper "authorized to perform" person per the manual. I'm going to upgrade my radio to the new Garmin GTR-225 and no LOA is needed. My biggest wants for LOA is the newer Aera 660 GPS, Garmin GTX-345 for ADS-B in/out because it's an all-in-one unit and not a piece meal install with multiple components and the Dynon AOA to make the plane safer. All these make the plane safer and lessen the pilot workload in my opinion. CAW, now CSA have been around for 10 years now and I'm very curious as to the number of LOA's that they've issued. Thanks Kreg. In my opinion it's the easiest way for the older fleet to upgrade for 2020. No modifications needed to the aircraft, just swap equipment. I just got back in town from Savannah and sent Patrick an email to get any updates from him. I'll report back when I hear from him. I got an email back from Patrick this morning. As of today I am now 2 months into the LOA process. Patricks response was "Nothing yet on any of the LOA's, I’ll press them". I replied to Patrick saying this was just unacceptable. Two months in and nothing? Patrick agreed with me that it's unacceptable and told me to contact them myself. I did email Patrick back for the name of his contact person at CSA for the LOA process but didn't receive an response as of this post. I sent an email over to the only person I know at CSA and to their general mailbox. I'll update everyone again if/when I get a response from them. I completely agree that the Letter of Authorization response time is unacceptably slow going with Czech Sport Aircraft (CSA). Of course, US SPORT AIRCRAFT is just the messenger and the conduit of information to the aircraft manufacturer CSA, WHO MUST WRITE AND APPROVE all the Letters of Authorization. I know that Patrick (and others) at US SPORT AIRCRAFT have worked many long hours on TECHNICAL INPUTS to Letters of Authorization, technical details of modification Installation Manuals, new circuit interfaces, engineering investigations, and more associated with LOAs. The LOA bottleneck is NOT US SPORT AIRCRAFT, as I am sure most all know by now. In my experience, an "easy" LOA took about one month to get approved through CSA. To swap the backup round dial altimeter from the stock "one pointer" device to a much more accurate, easier to read, three poInter backup altimeter. Same hole in the panel. Same hose hook up. No electronics. Well proven accurate 3 pointer backup altimeter. This "Easy LOA" took about a month. A "harder LOA", the NAVWORX TSO CERTIFIED ADS-B OUT/IN UAT, with several new electrical interfaces to the existing GARMIN transponder for squawk codes, Dynon D-100 for pressure altitude, GARMIN 696 display for ADS-B IN traffic, and power, indicator light, UAT mounting bracket, etc., took MANY MONTHS. about 6 months OVERALL start to finish from talking about it to installed, approved, LOA documented results. 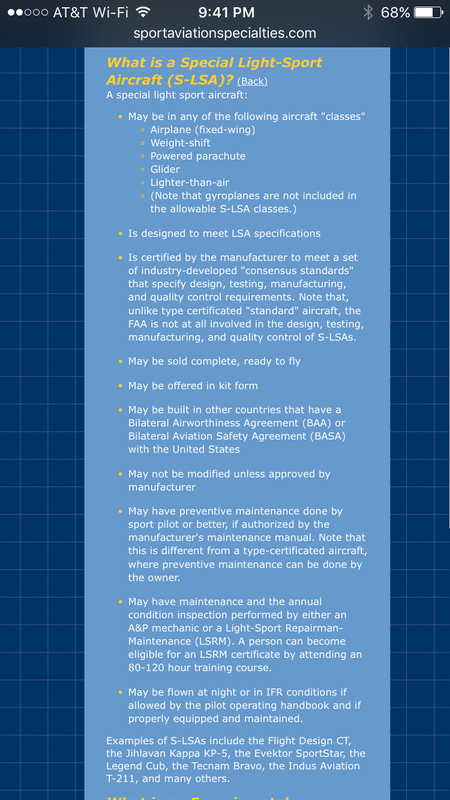 I understand that with the USA LSA rules, the approval authority for modifications is with the aircraft manufacturer, and they assume the risk. ASTM standards help. But MANY MONTHS on the LOA timescale is the wrong answer. 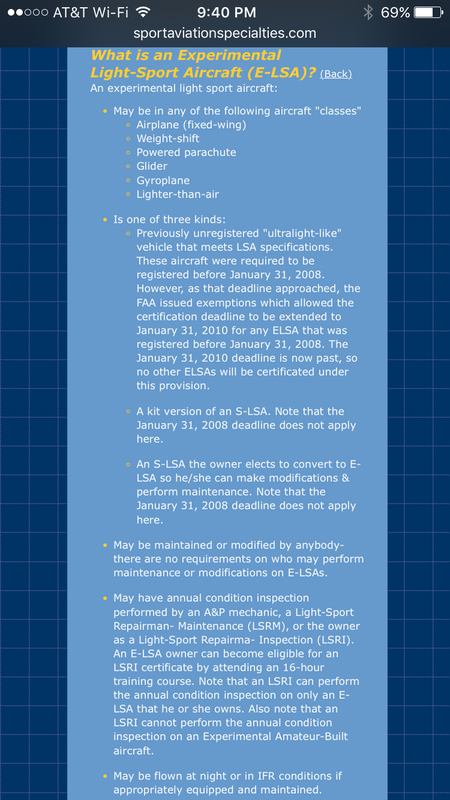 2) taking the S-LSA CRUZ aircraft to an Experimental E-LSA, where there is much more freedom to make modifications, such as turning on the Dynon Angle of Attack safety feature, or adding FAA required ADS-B OUT for older CRUZ models, and more LOA ideas discussed here in the SCFLIER FORUM. Yes, we all know US Sport is not the problem. It's been stated here many, many times and no one is blaming them. They are just the middleman in the equation. I told Patrick again I understand it's not him but CSA, I'm just frustrated that I've heard nothing or had any request for more info or data in 2 months. How can this be? I told Patrick this is unacceptable to me and that I'd like some sort of update from CSA. He then seemed upset with me and simply told me to contact CSA myself. So I sent CSA an email and we'll see what happens. They'll probably tell me to contact US Sport for updates. I know the SportCruiser is only a part of US Sport and they service and sell other brands and types as well. They are dealers for other aircraft and also service certified aircraft. I can understand where Patrick can get frustrated with CSA as well since he has us breathing down his neck for answers and he's getting nothing from the factory. CSA is now a small operation selling around 20 aircraft per year at US$150K each.Some of those are to new dealers. Few full-time staff - maybe two admin and two engineers, who have to deal with certification papers, SB/SAs, and also LOAs. So somewhat under-resourced.Most production staff have other jobs who do "evenings and weekends" when an order comes in. Sadly LSA manufacturers are likely "dead in the water" with changing medical regulation (FAA, UK CAA and more to follow quickly). The majority of LSA (in the US) were sold to light sport pilots (without medicals) who very soon will be able to fly C152/C172/PA28 etc. The survivors (Tecnam, Remos?) will probably be those players that diversified into alternative certification types. Includes some discussion of the SLSA to ELSA transition process. See pages 4-42 to 4-59. With the new proposed medical regulation this even more of a reason for all LSA manufacturers to work closely with their current owners to RETAIN them as owners. If the manufacturer alienates it's current owners for one reason or another how do they expect to keep them as owners and keep them from giving a bad review of the manufacturer or aircraft? Word of mouth in aviation is very powerful. Next thing you know owners are selling, flooding the market with LSA's and now the prices are dropping. If any manufacturer wants a stellar rating from it's owners they should take care of those owners, With prices where they are now it's only getting harder to get new customers. I'm just saying that they should take care of their current owners and work with them and not just brush them off. I'm willing to bet that all the current LOA requests are far from unreasonable and there are very few of them.